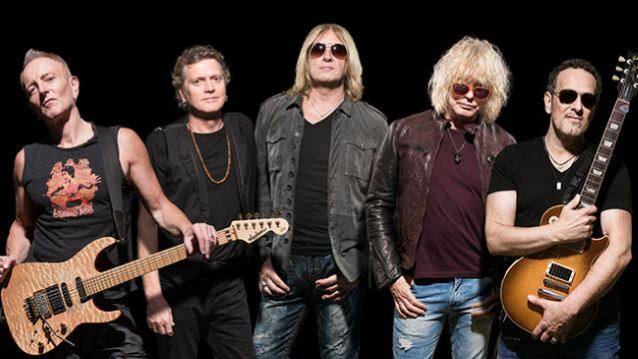 DEF LEPPARD has rescheduled the majority of their recently postponed tour dates with STYX and TESLA, according to The Pulse Of Radio. The tour played just one show — January 29 in Sunrise, Florida — before the dates were pulled with LEPPARD drummer Rick Allen tweeting about frontman Joe Elliott: "The doctor basically said that if Joe continues to sing without resting his throat for a month, he might do permanent damage... Rescheduling shows is really complicated. Sometimes the logistics just don't add up the way we want them to. Please accept my sincere apologies." DEF LEPPARD guitarist Phil Collen told The Pulse Of Radio he and his bandmates always look forward to playing their hits out on the road. "Every night when someone's singing along — especially when there's a lot of young kids there, 16-year-olds and that — it is fresh, actually makes you feel really good when there's a whole new breed of people just singing away to songs that you've done," he said. "It doesn't really matter whether it's a new song or an old song, it's still our song, so it's a huge compliment. It really is, it's the best thing in the world." DEF LEPPARD's latest, self-titled album entered The Billboard 200 chart at position No. 10 with first-week sales of just over 30,000 units — nearly all from pure album sales. The album is the band's first studio effort since "Songs From the Sparkle Lounge" in 2008.